Prime Dental, located in Milwaukie, Oregon, focuses on cosmetic, restorative, and preventive dentistry. Utilizing advanced dental technology, the Oregon natives aim to set themselves apart from the competition – starting with a completely custom website design from O360. Dental care is all about the small details; so is website design and development. We aimed to push Prime Dental ahead of the competition by creating a modern and professional website that highlighted their use of mobile, and modern dentistry. The site has a modern, professional appeal. We utilized the use of a hamburger menu instead of a traditional navigation menu to ensure that the background would catch the visitor’s eyes. Both the header and footer backgrounds feature a translucent, naturistic background to provide site visitors a sense of calming and assurance. When visitors click on the hamburger menu, the menu transforms into the traditional navigation menu with a fade-in effect. 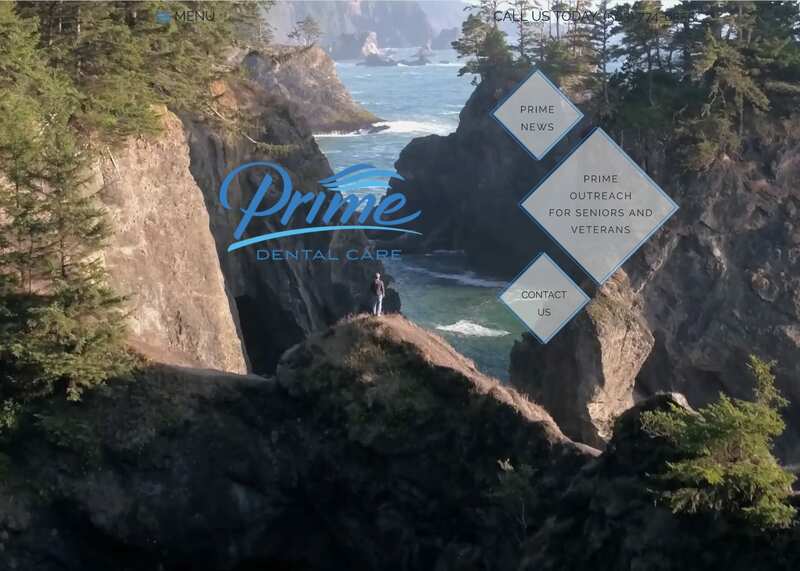 Even before visitors engage with the menu, when visitors enter Prime Dental’s website, they are greeted with a customized landing page that features more natural scenery. First impressions matter! We made sure visitors would feel welcomed in when visiting the website. Throughout the website, we utilized different hues of blue to soothe any sort of dental anxiety. In fact, Prime Dental’s personalized logo is a prime example of our color theme! On most of the inner pages, we used a white background to add a layer of professionalism along with helping readers digest the typography and information with ease. It is not solely coincidence that most medical websites use a blue and white color scheme. Blue and white are absolutely synonymous with the medical field! When used in unison, a blend of white and blue help create the perfect dynamic of contrast and action orientation. Good websites have good design elements. We utilized various entrance and fading special effects on different widgets and links throughout the website to help catch the reader’s eye along with adding a subtle pop to the text. To match the white background, we opted for square borders to keep the images and text in perfect harmony. We never want one aspect of the website to overpower another. The landing page also features diamond CTA borders as well. The contact page has not one, but two, Google Maps to help visitors reach their destination. We also provided a convenient form to contact the dentistry right under it, too. If you are ever looking for Prime Dental’s contact information, look no further than the headers and footers! We displayed the practice’s phone number and social media for increased engagement. We included many different marketing elements with Prime Dental’s design. In addition to the contact forms and social media widgets, we also highlighted the practice’s testimonials and blogs on the navigation menu. Both blogging and showing testimonials are great ways to increase your acceptance rate! Not only that, but it also shows that your practice cares about education and informing, in addition to just dental work. Prime Dental also services the community through its Mobile Dentistry Program. We made sure that site visitors would see this by highlighting it on the navigation menu as well. The website is a direct reflection of Prime Dental’s knowledge of the current dental landscape. From the images to the color theme of the website, all the design elements enunciate the practice’s use of advanced dental technology. The naturalistic images utilized on the landing page, header, and footer all give the practice a phenomenal first impression that the Oregon natives are welcoming and approachable, but still professional.